I had forgotten to change our HVAC air filter for way too many months, so this is what ours looked like when I pulled it out today. We had been having problems with our heater during the last month or so of the winter, in that it was taking way too long to heat our little house. I thought the worst and was expecting some expensive repair. Turns out, the filter was so clogged that it was inhibiting the airflow and making us cold during the nights. 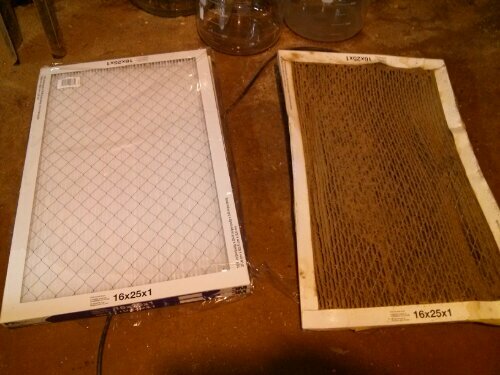 Change your filters folks. It’s time. This entry was posted in Crawlspace, DIY, Don't Hire a Professional, HVAC, Routine Maintenance. Bookmark the permalink.